ACTEX Learning offers students the option to use a remote proctoring service, ProctorU, for their VEE Course exams. It's important to offer a seamless, flexible and inexpensive alternative to the classic model. 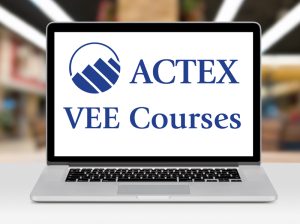 ACTEX VEE Courses all have a final graded component of a proctored final exam. Prior to engaging ProctorU, students had to find and schedule time with a designated actuary to "live-proctor" their exam, which for some students proved difficult due to location, timing, and other logistics. Students still have the option of engaging an in-person proctor, but the remote proctoring is designed to expand student choice and give you more control over when and where you take the exam. ProctorU affords students the comfort of taking the exam in their own home or office. The base fee for using ProctorU is $28, and is payable directly to ProctorU. ACTEX does not profit from fees paid to this service. Students using ProctorU must schedule their exam 72-hours in advance, or pay an additional “Take it now” fee. Students electing to take the exam using paper & pencil rather than CBT (Compute-Based Testing) will still need to find an in-person designated actuary proctor, or use a testing center that will proctor paper & pencil exams, for which students are responsible for any related fees. For more information, contact onlinecourses@actexmadriver.com.